Why lug home bottled water when a Brita Grand water filter pitcher can be yours at our everyday low prices at Today’s Concept. 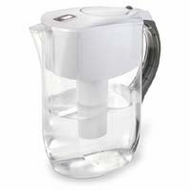 This Model 42556 three-quart Brita pitcher with filter has a soft grip handle and easy-pour lip-top lid. The activated carbon and ion exchange resin filtration system work together to reduce up to 99 percent of impurities for clearer, terrific tasting water. You’ll also be doing your part for the environment by not filling up our landfills with more plastic water bottles. It’s the perfect size for families and the office. Shop all our enviro-friendly finds for your home.